If you have submitted a clearance request and need to cancel it for any reason, follow these steps. 1. 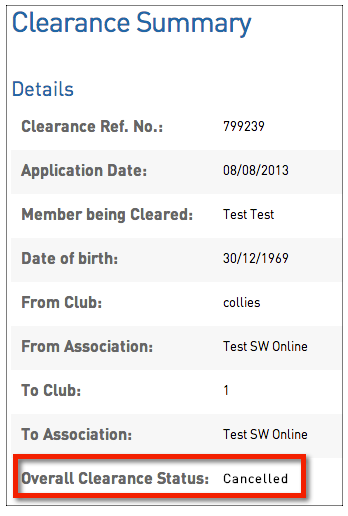 Click on Members in the menu and select List Online Clearances. 2. 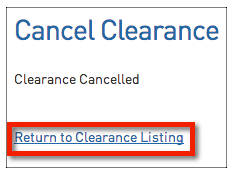 From the list of clearances, click on the Edit button next to the clearance request that you want to cancel. 3. The Clearance Summary screen for that player will appear. Scroll down the screen and click on Cancel Clearance. 4. A confirmation message will appear. Click on Return to Clearance Listing to go back to the Clearances List. 5. 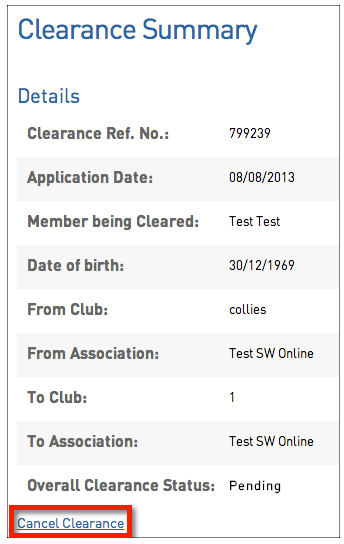 The clearance will still appear in the Clearances List, with a status of 'cancelled'. 6. If you click on the Edit button next to the cancelled clearance, it will also reflect that the clearance has been cancelled.